In just under 4 weeks I'll be heading to the Shetland Islands for Wool Week and I'm sure it's going to be fabulous. Little by little I'm preparing for the trip. Lists are being made, items for the suitcase are being put aside in a staging area, tickets are printed and, the hat is knitted. Each year there is an official hat of Wool Week. 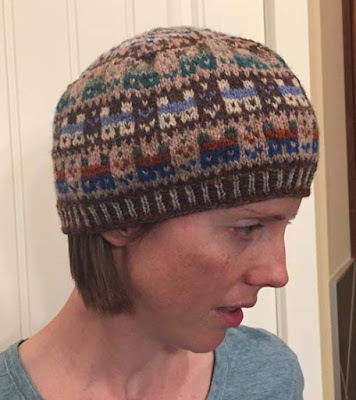 Last year it was the very popular Baa-ble Hat designed by Donna Smith. It's been spotted everywhere, even on the streets of New York and someone saw it on a TV show in the UK. This year's hat was designed by the 2016 Wool Week patron, Ella Gordon, the Crofthoose Hat. I liked it immediately. It puts me in mind of the houses you see dotting the Shetland landscape. I knew I was going to have to make it and take it to Wool Week. What I didn't realize was that I would want to make a second one. As I was knitting, my mind went to other color combinations. I can still think of other colorways that I'd like to see, but I doubt I'll make a third one. I .. don't .. think .. I .. will, but then..... :-) No, I have other project that need attention. The pattern is free. You only have to fill in a short form and it's yours. Yarn: I used more colors than the pattern called for. Some were a gift from the yarn shop, A Knitted Peace, that recently closed in Littleton, CO, some were purchased at Jamieson & Smith last year in Lerwick, Shetland and I picked up a few colors at Fancy Tiger in Denver, CO. For this hat, I used only Jamieson & Smith 2-ply Jumper Weight Wool.